"My Opinions" about Aquatics Business/Hobby, True Conservatism, Google, DCS/DHS, Dishonest Business Practices, Man-Made Global Warming, The Media, Faces of Evil, Recycling, Arrogance of our local and National Leaders and more. "Wall Street CEOs - the same ones who wrecked our economy and destroyed millions of jobs - still strut around Congress, no shame, demanding favors, and acting like we should thank them." "After all, Mitt Romney's the guy who said corporations are people. No, Governor Romney, corporations are not people. People have hearts, they have kids, they get jobs, they get sick, they cry, they dance. They live, they love, and they die." Once again a bold face and despicable lie by Elizabeth Warren; My brother in law & my friend Misti's husband is part of small corporations and last time I looked they were flesh and bones, had families, and HAVE been hurt by the Obama economy. Even large corporation are made up of stockholders, many of whom are retired persons that live off these investments. This lie in particular by Elizabeth Warren, is one many Democrats believe in. I believe it is a reason the amount of hate or rude emails and comments to my business have increased 5 fold since Obama took office. These people will write, call, etc with insulting language and worse, all the while thinking we are "the man". Sadly my business provides copious amounts of FREE aquarium & pond information that represent 1000s of hours of research and hands on experience, yet this is not enough for many liberal thinkers and we/I get attacked regularly in forums, emails, etc. These Obama and Democrat Platform inspired attacks have created "Straw Man" argument attacks on me where by persons will attempt to attack my information/answers articles by stating that because I sell certain products, my information is no trustworthy. This is no different that saying my friend's husband Nick who is a very honest jeweler cannot give trustworthy advice despite his years of training and hands on experience because he has something to sell. YET the democrats and corrupt followers in the mainstream media eat this BS up!!! "For the last two years, health care spending has grown under 4 percent, for the first time in 50 years. So, are we all better off because President Obama fought for it and passed it? You bet we are." Really? ?, our insurance and others I know have gone up dramatically DUE TO OBAMA CARE. The facts are as per our insurance and others with different policies that the new rules of Obama Care has raised the cost of doing business to the point that our primary provider dropped it altogether and the new provider raising premiums over $150 per month for our family. I should note that others have noted similar experiences with their insurance since these new provisions of Obama Care have been implemented. "President Obama gets it - because he's spent his life fighting for the middle class. And now he's fighting to level that playing field - because we know that the economy doesn't grow from the top down, but from the middle class out and the bottom up. That's how we create jobs and reduce the debt. He wants to give tax cuts to millionaires and billionaires, but for middle-class families who are hanging on by their fingernails? His plans will hammer them with a new tax hike of up to $2,000." First, as a proprietorship as are the majority of small businesses, I generate in gross revenue more than the $250,000 which Obama considers "Wealthy". This has increased my taxes and I now cannot expand my business, spend more, move out of my rat-trap 900 square foot home, or pay my employees as much as I would like to for the excellent work they provide for my business. 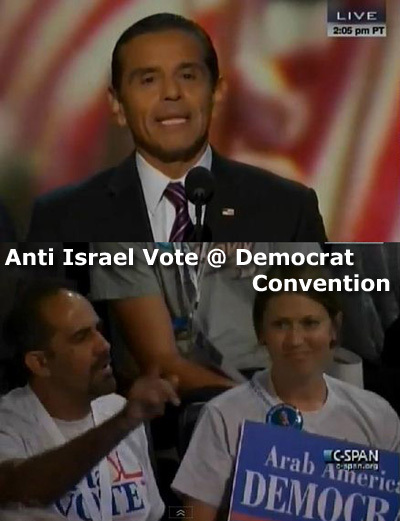 Here not only was the majority of the votes no displaying the hatred for Israel among Democrat delegates and the party in general; but a dumbfound Villaraigosa followed the instructions of the DNC to skirt normal procedure and jam through revised language. This political sleight-of-hand is the most transparent manipulation ever. What used to transpire in smoke-filled rooms was caught by cable news for all the world to see. Bluntly, any Jewish voter who votes Democrat is either suicidal or willfully blind. Then there was President Obama's AWFUL speech that was full of insinuations, lies, and plagiarism from the second worst president in history: Jimmy Carter!!! Obama's speech and its insinuations & lies, reminded me of the rude and often hateful emails and comments I deal with now on a daily basis (at least 5 times the level since this dishonest president took office. "If you can’t afford to start a business or go to college, take my opponent’s advice and borrow money from your parents." This is taking Mitt Romney out of context, & any intelligent person knows what he meant basically as do whatever it takes (legally) to get the money to start a business (I collected cans & cardboard @ 4 am as well as sold at early morning swap meets). I twice have had to start my business from scratch, the second after I had to flee my home town to protect my family from a predator which in emails even stated that he hoped Obama would be president someday so that persons such as my self would be destroyed!!!!!! I got no financial help from ANYONE you scum-bag of a president!!! How any moral person can vote for this man after his record of hate for what has made this country great and especially this DNC convention is beyond me, in fact this man should loose in a landside; but if not, GOD help our once great nation!!! Comments are welcome, including those that disagree. *Or any other of the many Logical Fallacies to attack the articles within WILL BE MARKED AS THE SPAM IT IS and not allowed! *What is Conservatism vs. Capitalism? *Oregon Rep. Earl Blumenauer, Anti-Semitic or maybe Nazi? *Is Grants Pass Oregon Family Business Friendly? *Midterm Elections 2010; Will we finally get it right? *Heath Care Reform, Period/ Interim Life Expectancy, etc. *Where is integrity any more? While I certainly have an interest in public policy and "righting wrongs" as expressed in the articles in this web site; my career and research has been into aquarium and pond keeping. I have spent 10s of 1000s of hours in hands on use, controlled experiments, and reading research into what methods and products works best for aquarium & pond care. This dates back to 1977 professionally and 1968 as a hobby. Ultraviolet Sterilization, THE AQUARIUM & POND UV AUTHORITY"
Yahoo Groups-Christian Poetry A Yahoo group with links to Christian Poetry and other related resources. Yahoo Groups-Shell Night Lights The delicate beauty of shell night lights. Also any topics about ocean themed decor. Poetry too! Is Grants Pass Oregon Business Friendly?